Family Super SUP Coasteering in stunning Newquay, Cornwall. Learn to knee paddle, stand up paddle, low level climb, leap into plunge pools and wild sea swim! Your family will learn to coasteer Newquay’s awesome coast before SUP touring to secret coves. Are you in need of some fresh ideas for fun ‘family days out’? We have the ultimate solution; the super SUP Coasteer designed specifically for families! This unforgettable experience combines the action packed elements of coasteering with the hilarious challenge of navigating a giant super SUP learning balance and paddle techniques, exploring the coast then deciding who’s king of the monster SUP with our epic games! 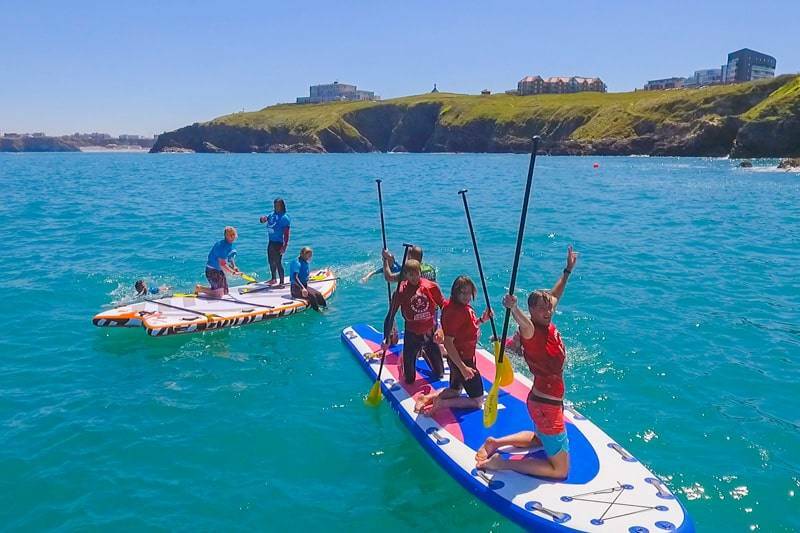 We’ve combined two of our favourite activities, super stand up paddle boarding with one of our award winning, adrenaline packed coasteers in Newquay! Once kitted out in a top of the range wetsuit, buoyancy aid, helmet and paddle, you will be given a full safety briefing and instruction of correct coasteering and paddle techniques for manoeuvring the super SUP! Coasteering satisfies the child within us all! Under the guidance of our expert instructors, you will have the opportunity to climb and traverse the cliff base, ride natural rapids and leap from over-hanging ledges into deep pools. You also learn skills for kneeling, standing and paddling the Super SUP board whilst identifying wildlife and native flora. The Newquay Activity Centre Cornwall takes safety seriously. We’re a certified ISA and Surfing England Centre Of Excellence and two times winner of the Cornwall Tourism Awards. We ensure the highest standards of adventure leadership and outdoor safety. Some inquisitive and friendly seals if you’re lucky!